For the Pros: The Whipper. Adds a touch of air to every bite. Within reach of the dedicated amateur chef, indispensible for the professional chef: a whipper which you can charge with either carbon dioxide (for instance to make carbonated fruit) or dinitrogen oxide (too make foams/espumas or simply whipped cream). For the Pros: The Sealer and Circulator. Cooks in a bag to lock in juiciness. 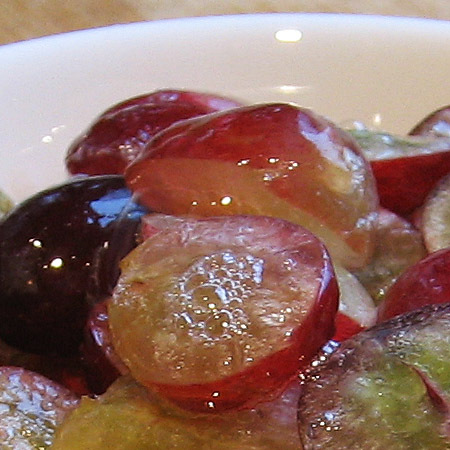 Sous vide cooking is perhaps one of the most fascinating examples of science inspired cooking. 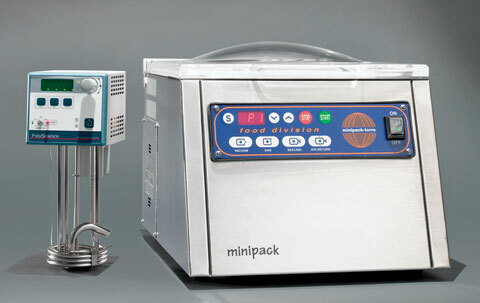 The picture shows a vacuum sealer and a thermostated water bath circulator. 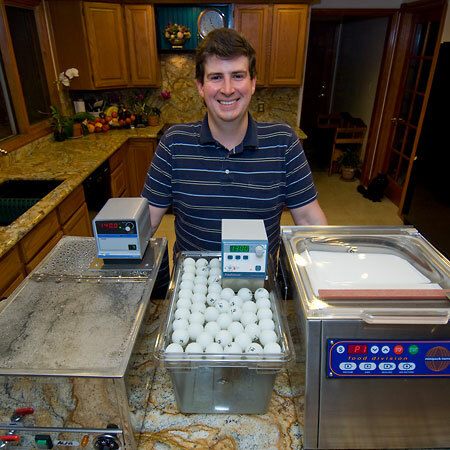 If this is too expensive, check out my post on a simple and easy DIY sous vide. 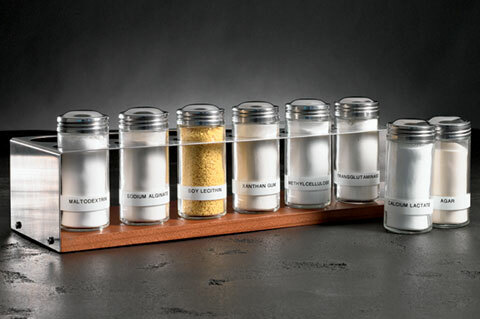 For the Pros: The New Spice Rack. Chemicals the experimental home chef shouldn’t be without. Last but not least: the different chemicals which become more and more available. I’ve put together a collection of hydrocolloid recipes which will help you get started using these fascinating chemicals. 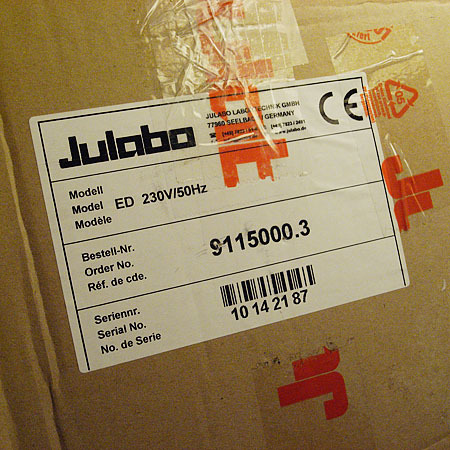 If you have troubles getting hold of these, my list of suppliers might help you. Of course I’d like to put my hands on a Pacojet, an Antigriddle or a Gastrovac as well, but for a home kitchen, this gets too exotic and far too expensive. 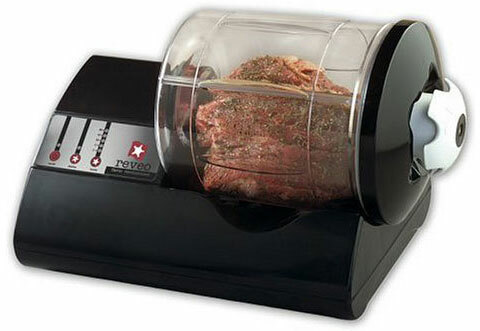 But – the most surprising gadget was the vacuum meat tumbler from Reveo. Just like the extremely expensive Gastrovac, this little machine can be used for vacuum impregnation of meat and other foods (or at least this is something I assume from the description). IMHO vacuum impregnation is the most important feature of the Gastrovac – far more important than the heating capabilities. Perhaps someone owning a Reveo could report back? But I was very dissapointed that my all-time favorite kitchen gadget didn’t make it into the gallery: a simple thermometer. As I have stated in one of my tips for practical molecular gastronomy, this is probably the single tool that can improve your cooking the most. In a comment to the last post, Chad asked how the clarification with laboratory glass ware works. Here’s how. Basically it’s a filtration. But if you would use a normal filter paper (such as a coffee filter) and let gravity pull the liquid through the filter, it would take ages. By applying a vacuum to the back side of the filter, the stock is sucked through (or pushed if you like by the atmospheric pressure). The are several possible sources of vacuum. 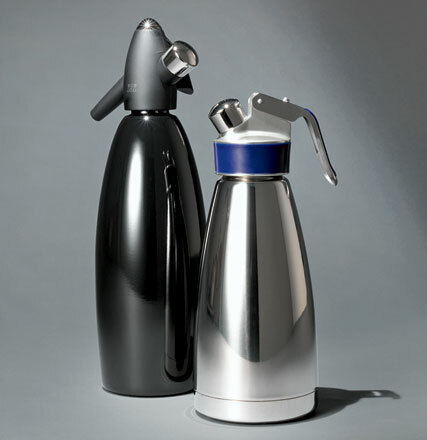 The simplest and cheapest is a water aspirator or a handpump. More expensive solutions include a membrane pump or an oil pump. The particles you want to remove are from 0.0001 mm and upwards to > 1 mm. The best thing would be to first pass the stock through a cheese cloth or a muslin, followed by one or more filtrations using filter paper. This would gradually yield a perfectly clear solution. 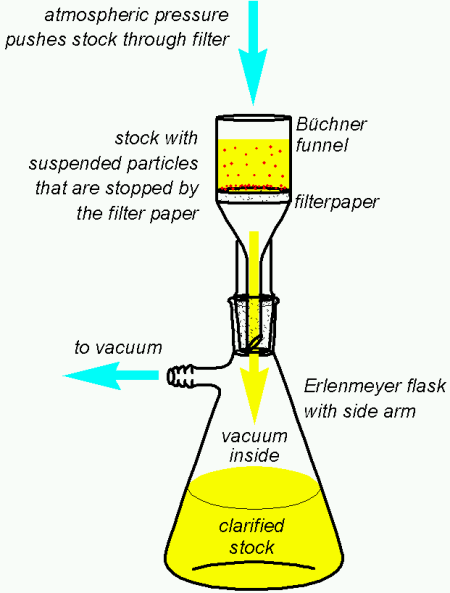 Pictures of a Bí¼chner funnel, Erlenmeyer flask and a water aspirator can be found on the tools page of Khymos. Pictures of a complete setup can be found by googling. If doing this in a kitchen, you would want to have an Erlenmeyer flask of at least 2-3 L as this is where the clearified stock is collected. 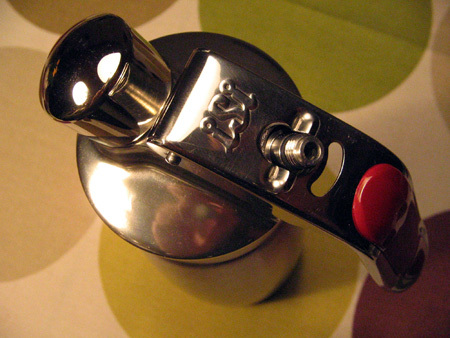 The Bí¼chner funnel should preferably have a diameter of 12 cm or more. 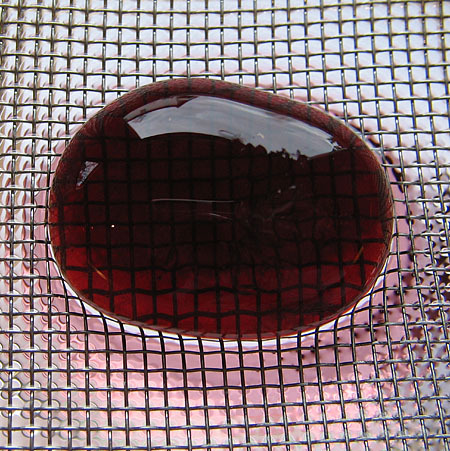 The fascinating thing about a filtration like this is that you can also remove color. At the EuroFoodChem XIV conference I was told by Jorge Ruiz of Lamaragaritaseagita that you can make perfectly clear tomato juice by succesive filtrations, starting with a coarse filter and moving to finer filters. All in all, 3-5 filtrations should be sufficient. 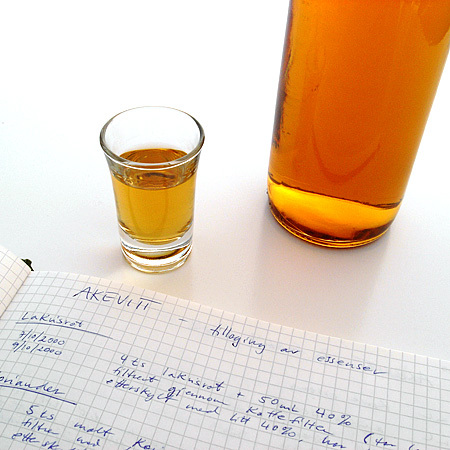 Here’s some pictures and a video of my first experiments with sodium alginate and spherification. I used sodium alginate from the Texturas series and calcium chloride from a drug store. Needless to say, I’m very fascinated by the texture and the whole process. 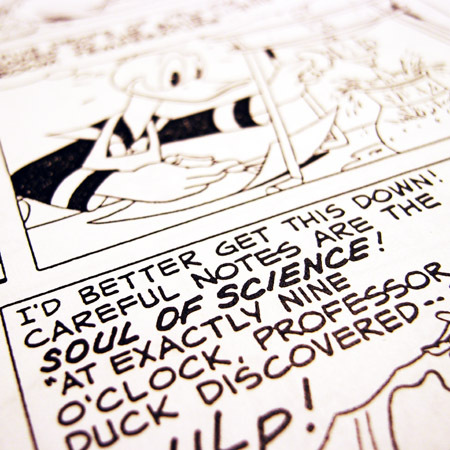 I have blogged about the chemistry behind previously. 2 g sodium alginate and 200 g water were mixed vigourously in blender. The mixture was then left to stand for some hours to get rid of the air bubbles. 50 g blueberry syrup was then added to the sodium alginate solution. A calcium chloride bath was prepared by dissolving 2.5 g calcium chloride in 500 g water. 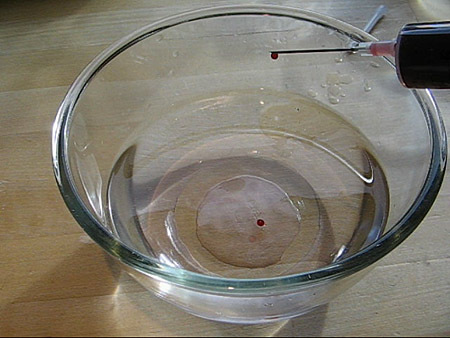 The sodium alginate/blueberry mixture was dripped into the calcium chloride bath using a plastic syringe with a steel cannula. 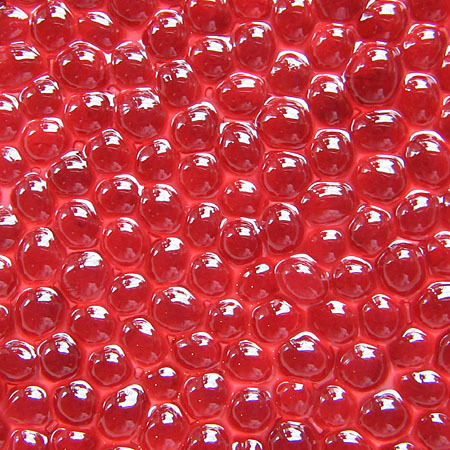 After 1-3 min the pearls were removed and rinsed with water. 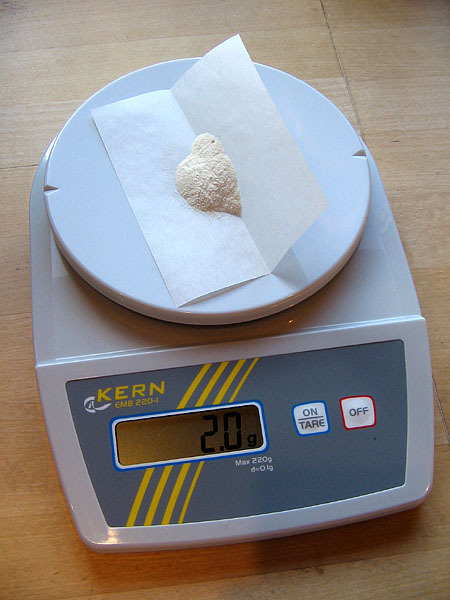 I had to obtain a scale with a 0.1 g accuracy to weigh out 2.0 g of sodium alginate (my first experiments using a normal kitchen scale failed). The model I got cost about $100 and is inteded for school laboratories. Amazon provides several scales with this accuracy. I used a blender to dissolve sodium alginate in water. This incorporates a lot of air in the mixture which we don’t want. It could possibly be avoided by using an immersion blender/mixer. However, I just left the alginate solution on the bench and after 3-4 hours the air bubbles had all escaped from the solution. Plastic syringes and cannulas can be obtained from your local drug store or pharmacist. I found it was easier to produce evenly sized drops with a sharp cannula (CAREFULL!) than with just the plastic tip of the syringe. This of course depends on the viscosity of the solution. By thickening (with xanthan for instance) you can produce larger drops. 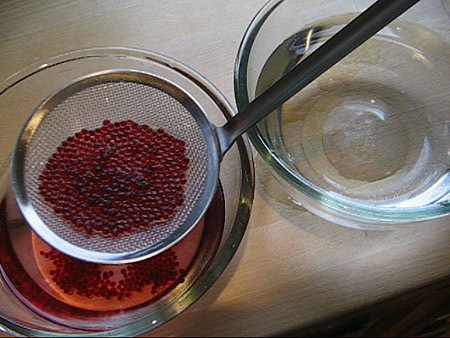 After 1-3 min the spheres were removed from the calcium chloride solution and rinsed with clean water. I dried the spheres carefully using a kitchen towel or paper. 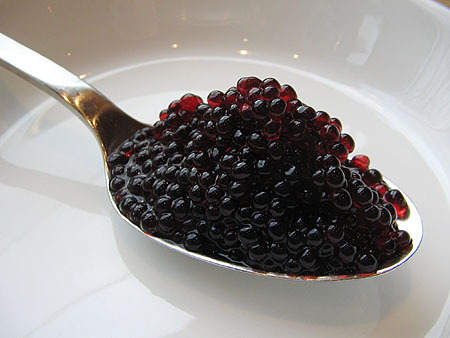 Definitely looks like caviar when presented on a spoon like this! Larger spheres were made by filling a small measuring spoon with the alginate mixture (I used a syringe for this so the outsides of the spoon would not be covered with alginate solution) and carefully emptied it into the calcium chloride bath. It takes some trial and error to achieve good results. The spheres are suprisingly robust and can be handled without rupturing. 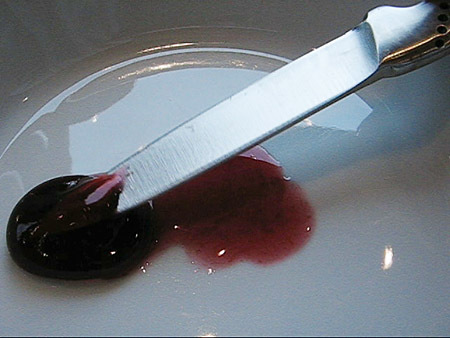 If cut with a knife, the spheres rupture and the liquid contents flows out. The small spheres didn’t taste much, so I could have added more blueberry syrup. The large spheres however had a nice taste. 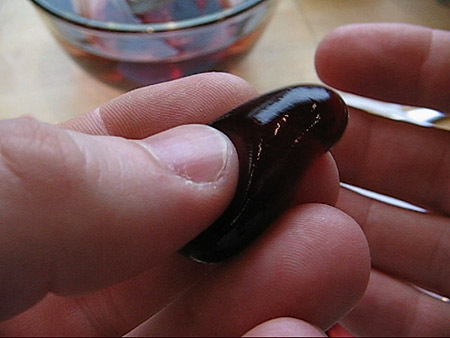 The surprise element when they rupture in your mouth is very nice! 2. 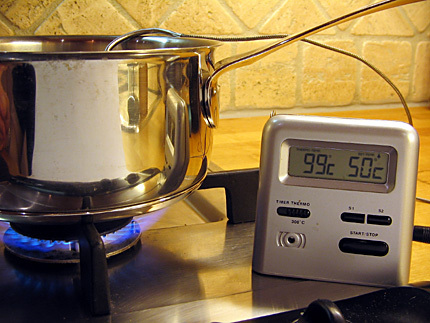 Know what temperature you’re cooking at. 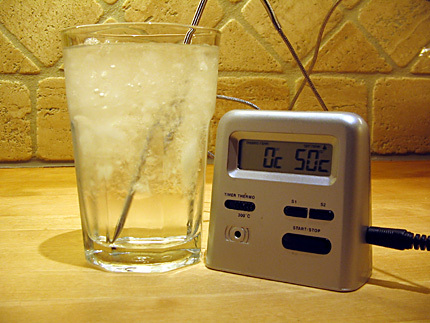 A dip probe thermometer with a digital read out is a cheap way to bring science into your kitchen. It should preferably cover the temperatures from -30 to 300 °C (-22 to 570 °F). It’s a good idea to check how accurate it is. 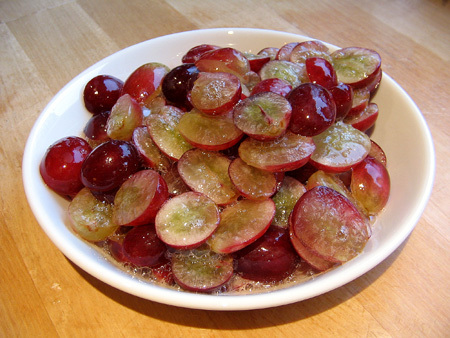 This is easily done using a water/ice mixture and boiling water. 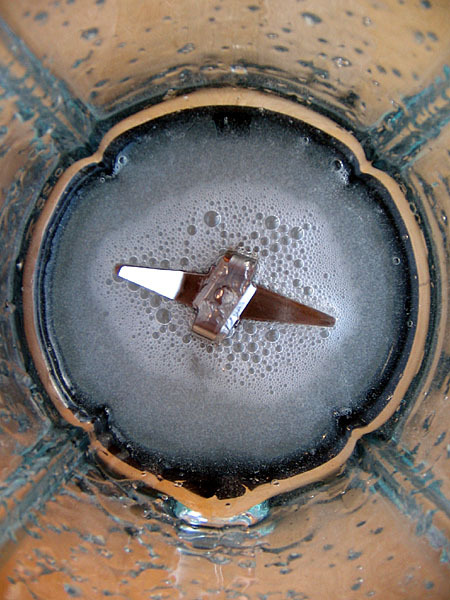 Fill a glas with crushed icecubes and top of with cold tap water. Leave if for some minutes for the water to cool and stir every now and then. Make sure the tip of the probe does not come in direct contact with ice. A mixture of water and ice is exactly 0 °C (32 °F). If the reading is off by 2 °C (~4 °F) or more I would take the thermometer back to the shop and claim a refund. 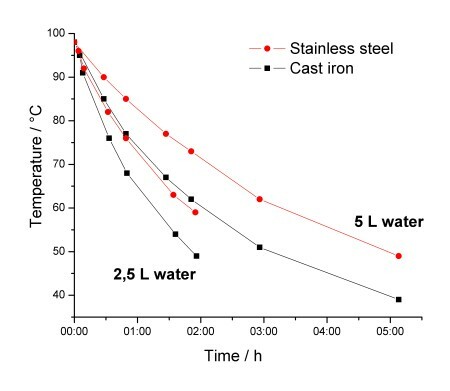 Similarly, you can use boiling water as a high temperature reference point. 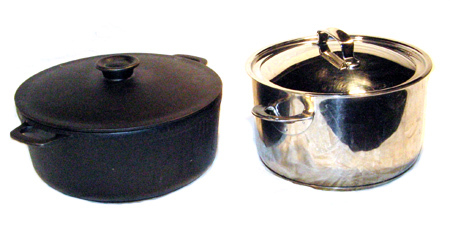 Water boils at 100 °C (212 °F) at sea level and standard barometric pressure. 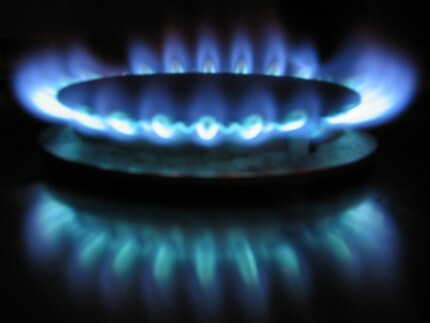 The exact boiling point at your location can be calculated. When I bought my first thermometer it turned out that the temperature readings were quite erratic so I had to return it. The one I have now however works fine (1 degree off for the boiling water is OK). As an addition to a dip probe thermometer, contact-less thermometers with infrared sensors are becomming more affordable. Suppliers include Raytek, Strathwood, Radiant (here, here or here) and Extech Instruments (links to product pages at Amazon).